Should Underride Technology Become a New Regulation? As all truckers know, accidents will happen on the road. No matter how safely you drive, a reckless four-wheeler or a slick ice road can come along and wreck your day and possibly endanger your life and the lives of others. When those unforeseeable incidents occur we often wonder if there is a way to prevent them from happening in the future. This pattern has led to revolutionary changes in the workplace and technological innovation. But it’s also led to unfair regulation and some bad ideas that didn’t work as intended. A new technology has been designed to guard underneath the trailer in order to prevent underride accidents. And it may soon become required for all trailers to equip them. Katie Strader joined the Truck Safety Coalition in 2014. This decision came after a tragic accident when her father drove underneath a jackknifed semi-truck. During the initial accident when the truck jackknifed, the truck driver blacked out. In an unconscious state, he was unable to warn Strader’s father and the group of coworkers he was traveling with of what lay ahead on the highway. To prevent such incidents in the future, Strader helped to create the Stop Underrides Act. To keep cars out from under the semi, Strader proposes the installation what looks like a harness. Two strips of resistant material will be stretched out to both ends of the trailer. The material will then be latched onto the front and back of the trailer on both sides. Another other potential idea looks more like a guard, which can be made of metal or another material. Either suggested underride technology would prevent small vehicles from passing underneath semi-trucks, which would reduce damage during a trucking-related accident and,to be blunt, would hopefully help drivers avoid complete decapitations. Adding more weight and gear to a truck is always a cost, and truck drivers and companies know that many won’t comply unless mandated by the government. If passed, this bill would make it mandatory to have underride tech installed. The Stop Underrides Act has bipartisan support and was co-sponsored by Senators Marco Rubio (R-FL) and Kirsten Gillibrand (D-NY). The bill has support from many groups, such as the following. The bill was introduced in 2017 and has since stalled in Congress. 2019 brings a new Congress, however, and there may be new political will to bring the bill to a vote. Safety Benefits of Underride Guards? Despite the good intentions behind the potential law, the Stop Underrides Act may do more harm than good according to Todd Spencer, President of the Owner-Operator Independent Drivers Association, or OOIDA. Spencer claims the equipment would result in “little, if any, safety benefit”. 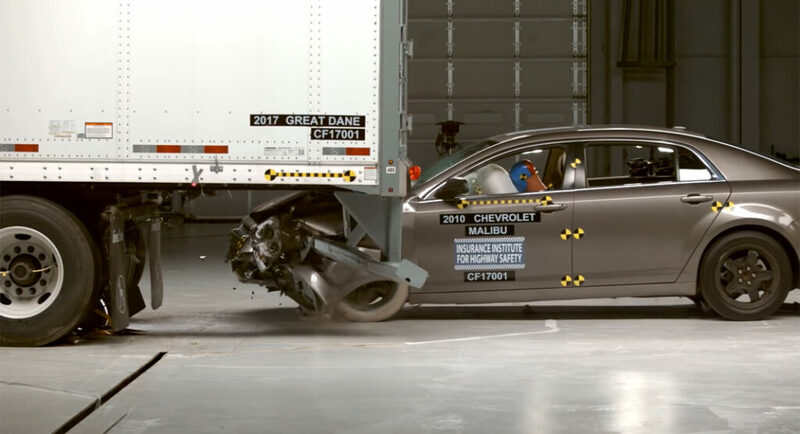 On the other hand, the Insurance Institute of Highway Safety (IIHS) released a study with evidence suggesting that the guards may indeed reduce fatalities. A major concern is cost. Equipping each and every semi-truck with a safety harness, or guard, may cost billions of dollars. And of course, owner-operators that own their trucks will be stuck with the tab. Aside from those issues, any additional gear added to semi-trucks increases its weight. Which reduces how much can be transported per run. To get around this issue, Strader suggests increasing the maximum weight restrictions to offset the slight increase. What do you think? Do the potential benefits outweigh the costs? Are you in favor of new guards, or do you believe there is another solution?